Junot Díaz reflects on the novel. Around 50% of this figure (close to 37 million) is hosted on the free WordPress.com. 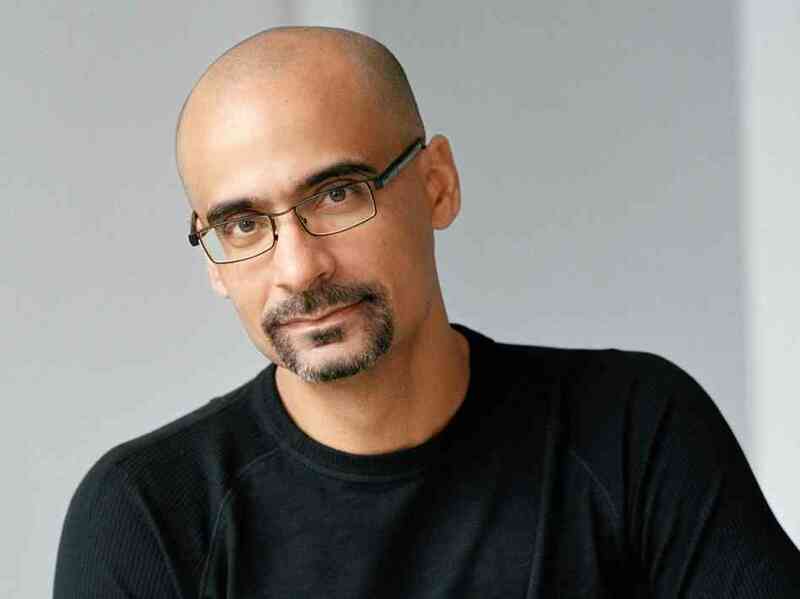 Junot Díaz (born December 31, 1968) is a Dominican American writer, creative writing professor at Massachusetts Institute of Technology (MIT), and fiction editor at Boston Review. He also serves on the board of advisers for Freedom University, a volunteer organization in Georgia that provides post-secondary instruction to undocumented immigrants. Central to Díaz’s work is the immigrant experience. He received the Pulitzer Prize for Fiction for his novel The Brief Wondrous Life of Oscar Wao, in 2008. 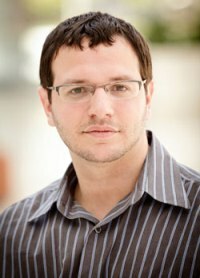 He is a 2012 MacArthur Fellow. Recently, the Big Think blog had an article by Díaz that I wanted to share with you dear readers of Learning from Dogs. For it struck me as a wonderful reminder of the power of writing and, especially, the power of writing fiction. For reasons that I don’t understand the video in that Big Think piece is longer than the version that is on YouTube. So, watch the YouTube version coming up now, and if you want more then click the link just below that YouTube insertion. Literature, explains Pulitzer-winning writer Junot Díaz, is the closest that we’ve come to telepathy. It’s through literature that we educate our souls by transporting ourselves into some other character’s mind. It builds empathy. It allows for new perspectives. It triggers provocation in all the best ways. Novels aren’t as popular a medium today as something like Twitter, but that doesn’t mean they’re not still hugely important. The summary posted above was taken from the Big Think site, and if you go there you can read more, and watch the full 4-minute version of the video. Finally, this coming Sunday is the 1st November, and November is the month for National Novel Writing Month. Whether or not you wonder if you have a full novel inside you, even if you have the slightest curiousity, pop over to the NaNoWriMo website and get involved! A highly fascinating glimpse of a lightning strike. As seen on ‘big think‘. “This is a once in a lifetime photo”, says Arron McNally. “There will never be one like it again”. 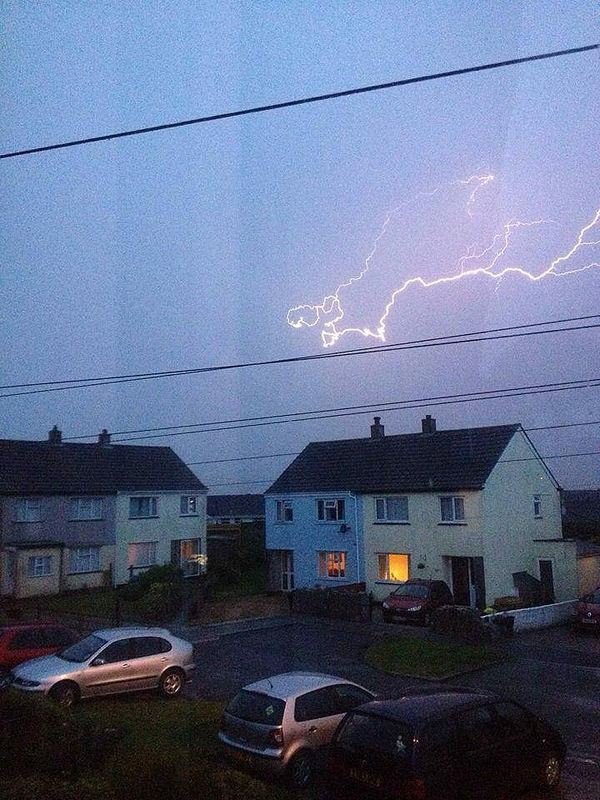 A few evenings ago, the Cornish father of five was watching a spectacular electrical storm with his wife Krista Oflynn from their daughter Kelly’s bedroom window. 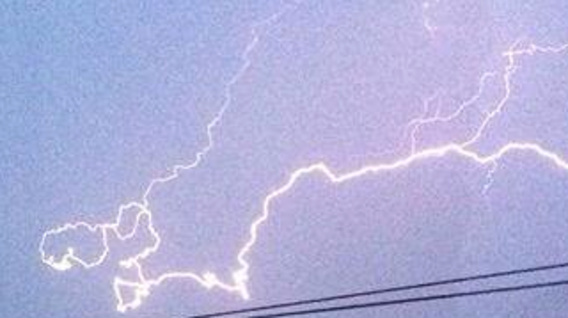 No doubt to allay the four-year-old’s fear of the storm, mum and dad started a competition to see who could snap the most spectacular fork of lightning on camera. “When I caught this one I knew I was the winner”, Arron (26) says. Scrolling back to see the picture he had taken of a particularly bright strike nearby, he immediately recognised the outline: “It was exactly the same shape as Cornwall – it was as if someone drew a map of the county in the sky”. The incident is related in the Plymouth Herald, which covers parts of Cornwall and Devon, in the southwest of England. The paper quotes unnamed ‘experts’ who claim this is “the first time on record that a place has been struck by lightning which looks like the area itself”. While that sounds suspiciously like that old trick in the journalist’s book – faking an ‘anonymous source’ to use an unverifiable quote you came up with yourself – it is true that the resemblance is uncanny. Cornwall is England’s southwesternmost county, a wedge-shaped peninsula dividing the Celtic Sea to its west from the English Channel to its east. The peninsula’s tip is known as Land’s End. On the other side of the county, the River Tamar separates Cornwall from Devon, and the rest of England. Some would even say: from England proper – Cornwall, although officially English, has its own Celtic history, culture and language. Some locals promote the separate Cornish identity (reviving the virtually extinct Kernowek language – see also #13) and even strive for larger political autonomy. In April 2014, the Cornish were granted minority status under the European Framework Convention for the Protection of National Minorities. The bolt of lightning photographed by Arron McNally mirrors the geography of Cornwall in a few crucial areas. The main streak at the bottom and the secondary one on top together suggest the wedge shape of the county. Two protrusions at bottom left of the fiery constellation resemble Land’s End, the neighbouring Lizard peninsula (Britain’s southernmost) and Mount’s Bay between them. In fact, the Lizard is suggested twice, by a second downward stab of lightning to the right; next, a hint of the gentler curve of Falmouth Bay. The fainter, northerly streak of lightning also shows a passing resemblance to the northern Cornish coastline, from St. Ives Bay to where the line fades. The ‘meteorologists’ quoted by the Herald may or may not be right in claiming that the Cornwall-shaped lightning is a ‘world first’ – how could you be sure of either? – this certainly isn’t the first time this blog has reported on weird territorial echoes. Many thanks to Stijn Meuris for sending in this picture. Main info from this page at the Plymouth Herald. Bigger image of the lightning bolt taken here from the Jedi Council Forums. You all have a great weekend and don’t stand out in the open if there’s a thunderstorm about! More on using our minds. Interesting sequel to yesterday’s post. Yesterday, I published a post under the title of Just to focus our minds. It featured a chart that demonstrated how long Planet Earth would take to ‘recover’ if the human race disappeared today. 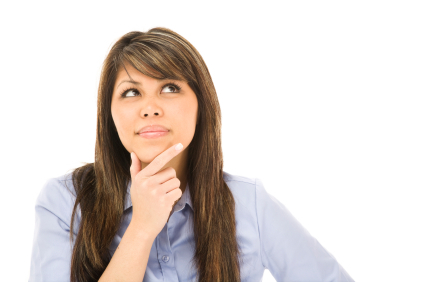 Why today’s post seemed a perfect companion was because it explores how we could think better. For if the human race doesn’t quickly find a way to think better, then that aforementioned chart may not be such an academic abstract after all. The post is more or less a copy of what appeared on the Big Think blogsite, a site I have been following for some time now. 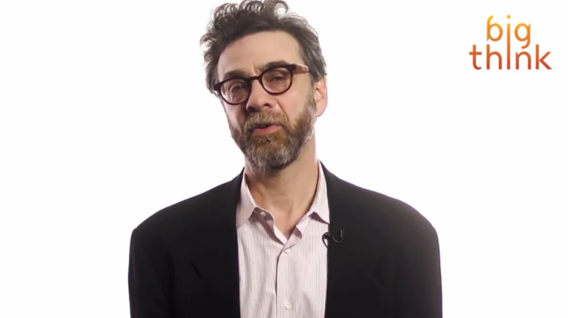 Stephen Dubner and economist Steven Levitt co-authored the book Freakonomics. If you are interested, the Freakonomics website is here. Being tied to that mast! What an expanse of learning is out there in this modern interconnected world! I try to limit my following to those organisations and writers who offer me the opportunity of learning. Whether something I was previously unaware of or a sight of the world from an unfamiliar perspective, it’s a rare day when something doesn’t ‘pass my screen’ that offers an ‘Ah, ha’ moment. Such as the following essay by Dave Nussbaum that recently appeared on the Big Think website. Cheekily, I asked permission to republish and promptly and generously both Dave and Daniel Honan, managing editor of Big Think, said yes. Thank you, gentlemen. I am currently an Adjunct Assistant Professor of Behavioral Science at the University of Chicago Booth School of Business. I received my PhD in Social Psychology from Stanford in 2008, working primarily with Claude Steele and Carol Dweck. I recently completed a SSHRC Post-Doctoral Fellowship at the University of Waterloo with Steve Spencer. My research is primarily focused on how people manage and defend their self-image in the face of threats, and how this affects their beliefs and behavior. I also explore how social contexts and psychological processes can either exacerbate threats to self-image or attenuate them. I have found that defensively managing self-image threats can often lead to negative consequences, including academic disidentification, missed learning opportunities, the avoidance of important medical tests, and persistence in failing investments. I believe that by identifying contexts and processes that attenuate threat, individuals and organizations can employ strategies to prevent these maladaptive outcomes. So moving on past my quip about the length of Professor Nussbaum’s title, the summary above shows that this is one smart cookie! Just go back and reread “My research is primarily focused on how people manage and defend their self-image in the face of threats, and how this affects their beliefs and behavior.” Then reflect on the range and scale of ‘threats’ facing millions of us across the world. So research into “how social contexts and psychological processes can either exacerbate threats to self-image or attenuate them“, seems particularly appropriate for these times. OK, without further ramblings from yours truly, here is that essay. According to legend, the Sirens were beautiful women whose voices were so alluring that when sailors heard their song they could not resist approaching and were drowned on the rocky shores of the island where the Sirens sang. No sailor had heard their song and lived until Odysseus, who, on the counsel of the goddess Circe, had his crew tie him to the mast of his ship. When he heard the Sirens’ song he begged to be released, but his crew, their ears plugged with beeswax, would not unbind him and saved him from his own desires. 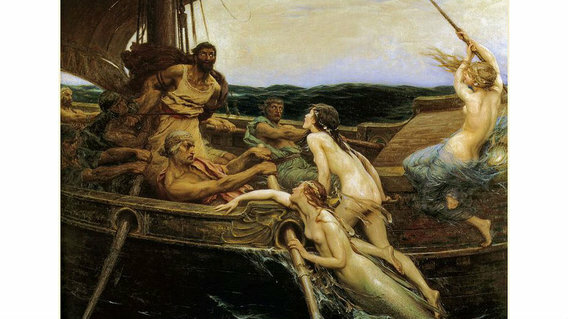 Odysseus was lucky – he knew that he would be unable to resist the Sirens and had himself bound – but people often have difficulty foreseeing their weakness from a distance. Sometimes they need help. I love watching my not-quite-two-year-old son learn about the world from his mistakes. I look on with sympathy at his falls and bumps and spills and I try to restrain myself from interceding. But when he’s about to tumble down a flight of stairs I step in. It is difficult to balance preserving his freedom to explore and make his own mistakes with the desire to keep him safe. There’s a lot to be said for giving kids autonomy and letting them learn from experience, but sometimes you have to behave paternalistically and tie them to the mast (or at least install safety gates). When you start treating grown men and women like you’re their father, though, the charge of paternalism becomes a more serious one. There may be cases in which a heavy-handed approach is necessary (particularly when people’s actions harm others), but we should be careful about using it. A more circumspect approach is libertarian paternalism, described by Richard Thaler and Cass Sunstein in Nudge (and re-articulated more recently by Sunstein in his Simpler) as a way of influencing people to make decisions that they themselves would consider beneficial, without restricting their freedom. On its face, Loewenstein’s claim may seem paradoxical – isn’t a person most free when presented with all her options and allowed to choose among them? But as the mythical Sirens make clear, there are some options that we are not truly free to resist. Without beeswax in their ears Odysseus’ crew would have been doomed; the wax gave them the freedom to choose. Take the recent attempt by New York City Mayor, Michael Bloomberg, to forbid stores from displaying cigarettes to their customers. Just like the beeswax did not prevent the sailors’ from choosing to hear the Sirens’ song, hiding cigarettes from view doesn’t prevent people from buying them. But, as Loewenstein explains, it makes it easier for those who may be trying to quit to avoid being lured back in. 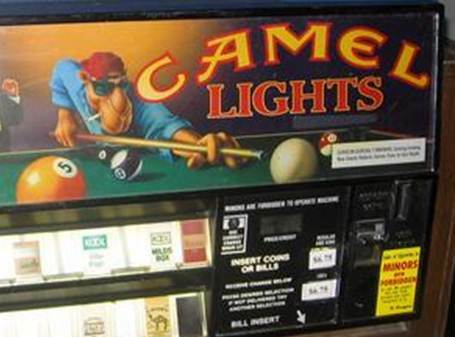 When we pass laws that forbid the sale of cigarettes to minors we are being paternalistic. We are tying Odysseus to the mast, whether he likes it or not. But when we ban cigarette advertising that targets children – as the FTC did when it banned Joe Camel ads – we’re not tying anyone down. We are merely acknowledging that children are vulnerable to influences that may lead them to act contrary to their own interests and that they may not be in a position to resist these influences. Banning the display of cigarettes in stores is merely acknowledging that children aren’t the only ones who are vulnerable. The cigarettes, like the sirens, draw us in against our will. Putting them out of sight is like putting wax in our ears – we can easily still give in to temptation if we choose to, but we’re less at its mercy. Maybe not from a Mayan perspective but, nevertheless, who knows! For some time now I have subscribed to the online magazine Big Think. Daniel Honan, Managing Editor, has contrived to bring together a group of very interesting authors from a wide range of disciplines, presenting a weekly collection of thought-provoking articles. Despite the volume of emails that seems to assault my in-box each day, it’s very rare for me not to browse the weekly digest from Big Think. Thus it was that early on the 13th (last Thursday) I read a wonderful item written by Steven V. Mazie, Associate Professor of Political Studies at Bard High School Early College-Manhattan. A quick telephone call to Dan Honan produced an immediate ‘yes’ to my request for permission to republish the Steven Mazie piece here on Learning from Dogs so settle back and enjoy. Let’s say you’re just now tuning in to reports that the world will end on December 21 when the Mayan calendar resets to zero. Maybe you’re one of the 35 million Americans who fear it will really happen. Maybe the prospect of solar storms, rogue planets and devastating floods is a welcome distraction from more pedestrian anxieties of everyday life. Or maybe you’re just curious how such a ridiculous idea could persuade “panicked” Russians to buy up all the “matches, kerosene, sugar and candles” in town or spur a Chinese man to spend his life savings building an ark to keep him afloat after the catastrophe. Where do you turn to learn more? To the epistemic umbrella of the 21st century, of course, and here is what Google will show you. Do you consult the first hit, billed as the “official website for 122112 information”? Do you settle for the detailed account in the Wikipedia entry, listed second? Or do you flick down to the third, an earnest attempt by NASA to explain “Why the World Won’t End”? The problem is that credible science often fails to convince the masses. It cannot budge the majority of Americans who continue to deny the reality of evolution. It cannot convince more than 41 percent of Americans that the activities of human beings play a role in global warming. It’s no wonder, then, that so many people worldwide are keeping doomsday supply companies in business, buying up freeze-dried food rations and personal bunkers rather than Christmas presents, or that sites like December212012.com are profiting from these advertisers. It’s dispiriting to witness the mass delusion of a tenth of humanity. You have to feel sorry for the Chinese ark-builder who will be left penniless on December 22, and you have to empathize with the people who are contemplating killing their pets or committing suicide to avoid the doomsday devastation. What you believe depends on who you believe. And who you believe depends on what you believe. Your beliefs, your knowledge, your experience, your assignments of what I’ll call epistemic authority, that is, who or what sources are trustworthy on what issues: all are caught up in each other…Whether it’s rational for you to believe something depends on how it fits in with what you already believe, not least about the credibility of those reporting it. The best argument against the doomsday believers may come on December 22, when, with any luck, most of us will still be around. But as my fellow blogger David Ropeik explained recently, and as Herzog’s analysis indicates, the next epistemological doomsday is just around the corner. My judgment is that I should leave this post as it is. As a slightly tongue-in-cheek review of this much heralded prediction. More footage from Chasing Ice, an astonishing clip of the largest iceberg calving ever recorded. Arctic sea ice levels this summer hit a record low; according to the U.S. National Snow & Ice Data Centre in September, more than 600,000 square kilometres more ice had melted in 2012 than was ever recorded by satellites before. We are indeed melting our children’s future, and apparently many of us are too busy to hold our governments to account for their lack of action. If we don’t change our ways on this beautiful planet pretty damn soon, then my guess is that we are headed for a massive depopulation and a return to a much more primitive lifestyle, a future that will be brutally obvious by 2020. What is relevant, to a degree unprecedented in the history of humanity, is how the peoples of this planet respond NOW! In many ways, it’s helpful that despite being a resident of the USA I am not eligible to vote. That’s because my residency status as a ‘Green card’ holder does not give me such entitlement. That’s the domain of citizens, and rightly so. The reason I find it helpful is that as a non-voter and still very much the ‘newcomer’ to this county, I view the proceedings from a different perspective; well that’s my take on things! So here are two thoughts. 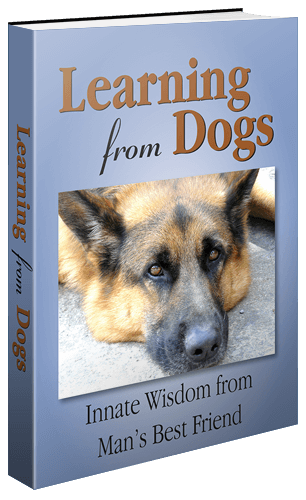 The motivation behind Learning from Dogs came from the realisation that dogs offer mankind many lessons, especially the one of behaving with integrity. You can read more about this aspect of dogs here. 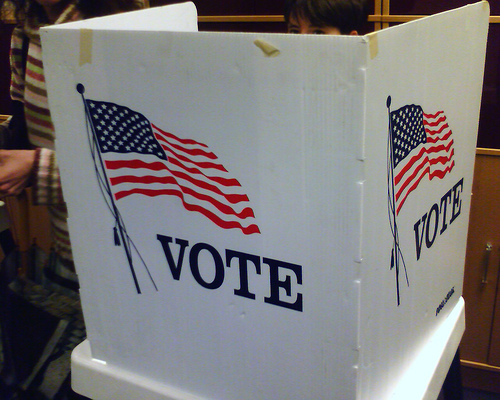 If you are not planning to vote in the upcoming election, Larry Lessig has a good explanation why. You, like most Americans, believe that money buys results in Congress. No matter who wins, you believe that corporate interests will still have too much power and prevent real change. You are correct in your belief that money buys results in Congress, Lessig says. However, he has a different prescription than non-participation. Lessig points out that .000015 percent, or 47 individuals, have given 42 percent of the Super PAC donations this election cycle. As a result of this “money election,” Lessig says a few powerful interests exert an influence that conflicts with the public good. “… 47 individuals, have given 42 percent of the Super PAC donations this election cycle.” Just reflect on the power and influence that flows from such a distortion of fairness. My second thought is about being truthful. The time for all our leaders, right across the world, to come together and face the reality of climate change is upon us. There is no time left to duck and weave. Peter Sinclair of ClimateCrocks blogsite recently posted this video. Watch it and ask yourself how much longer the leader of the most powerful nation in the world can sit on the sidelines of the greatest threat to our civilisation ever seen. Evidence that supports the notion that deliberation is really rather a good idea! that proposes that the world of speed and instant decisions is much less efficient than giving things a decent ‘coating of thought’. These thoughts have been inspired by two (slowly savoured) works of management theory: an obscure article in the Academy of Management Journal by Brian Gunia of Johns Hopkins University; and a popular new book, “Wait: The Art and Science of Delay”, by Frank Partnoy of University of San Diego. Mr Gunia and his three co-authors demonstrated, in a series of experiments, that slowing down makes us more ethical. When confronted with a clear choice between right and wrong, people are five times more likely to do the right thing if they have time to think about it than if they are forced to make a snap decision. Organisations with a “fast pulse” (such as banks) are more likely to suffer from ethical problems than those that move more slowly. (The current LIBOR scandal engulfing Barclays in Britain supports this idea.) The authors suggest that companies should make greater use of “cooling-off periods” or introduce several levels of approval for important decisions. Readers who want to read Brian Gunia’s research article may find it in full here. Details of Frank Partnoy’s book are here. There’s a video interview with Slavoj Zizek in that Big Think article that isn’t available on YouTube, so to watch that video and read the full article, do go here and enjoy! But there are other videos of Slavoj Zizek (anyone know how to pronounce his name??) on YouTube and I selected this one as possibly being of wider interest. Philosopher Slavoj Zizek argues environmentally conscious consumers are desperate for simple tasks they can perform to alleviate their guilt, so they do things like purchase overpriced organic produce. Zizek also highlights Starbucks, which he suggests attracts customers by appealing to their sense of altruism. Complete video is here – Slavoj Zizek: Catastrophic But Not Serious. It’s over two hours long but strikes me as two hours of very educational viewing from The Graduate Center, City University of New York. Aspiring innovators don’t need pep talks. They need TIME. Time to think. And time to dream. Time to collaborate. And time to plan. Time to pilot. And time to test. Time to tinker. And time to tinker again. Fancy that! Think I’ll go and lie down and have a good think! Brilliant mathematics without the need for a calculator! 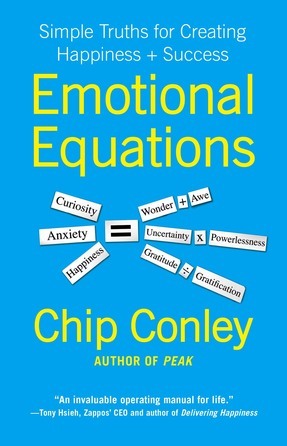 The quote that I thought was relevant was this one from Descartes, “With me everything turns into mathematics.” Well until I read something recently on the Big Think website I would have been certain that the emotions, such as happiness, were well beyond reach of the logical power of mathematics. I was wrong! ….. argues (against Einstein, as it happens), that everything that counts can and ought to be counted. A hotelier by trade, he says that GDP and the bottom line are blunt instruments for measuring the health of a society or a business. 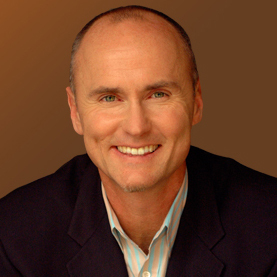 After the dot.com crash of 2001, and a visit to the Buddhist nation of Bhutan, which has a “Gross National Happiness” index, Conley and his team decided to create indices for measuring the well-being of their employees and customers. So it all seems not quite so daft as one might initially guess. Indeed, settle down for twenty minutes and watch Chip eloquently explain his ideas captured at that TED Conference referred to above. There’s also an audio conversation with Mr. Conley that you can download free from here. Finally, let me close with yet another quote from Rene Descartes, “It is not enough to have a good mind. The main thing is to use it well.” Amen to that!